There’s no winning when you’re UFC president Dana White. One one hand, some fans complain there are too many events with insignificant bouts throughout the year. On the other hand, fans scream to the high heavens when the promotion cuts solid fighters. 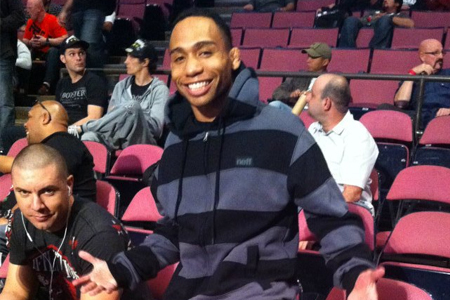 White offers up a simple, yet realistic, explanation for both arguments – look at former flyweight top contender John Dodson (pictured). Dodson, who White professes is the second best 125-pounder in the world, fought for just the second time in 2013 on Saturday despite being healthy the entire year. So, why the 10-month layoff for a locked-and-loaded Dodson? “Our roster is too full,” White said following Dodson’s UFC 166 victory. “Guys have to get fights. Despite holding 33 shows this year (one more than in 2012) with about 12.5 fights per card, the UFC still can’t find the space to keep everyone active. That’s one of the reasons why a talented veteran like Yushin Okami was shown the door. “I like Okami a lot,” White stated. “He’s a great guy. But when guys lose, when guys are at certain points of their career, or whatever it might be, guys have to be cut to thin this roster out, so guys like Dodson can continue to fight. On a side note, I believe this is the first time White has revealed the UFC must pay its athletes for not competing.